MUMBAI, INDIA and NEW YORK, NY--(Marketwire - October 26, 2009) - WNS (NYSE: WNS) is pleased to announce that at the Worldwide Conventions & Business Forums (WCBF) 4th Annual Global Lean, Six Sigma and Business Improvement Summit & Industry Awards held at Orlando, FL, USA, on 14th October 2009, WNS won the "Best Project Achievement in Green Six Sigma" award for the Green Lean Sigma Program, beating out two others in the category. The Global Six Sigma and Business Improvement Awards are steered by an independent Advisory Panel and judged by a panel of independent business improvement experts and practitioners. WNS was recognized by a distinguished panel of judges for its organization-wide initiative, aimed to make WNS a carbon neutral company leveraging Six Sigma, Lean and ISO methodologies. The Green Lean Sigma program was driven by a core team of quality professionals led by Dr. Ujjwal Majumder, Chief Quality Officer and Ms. Shubra Sachdev, Associate Vice President, Business Process Excellence & Transformation and a Six Sigma Black Belt. The application that was sent across to the panel of judges included the 80 projects completed under the overall Green Lean Sigma (GLS) project. The scope covers Travel & transport reduction, Electricity, Water & Paper consumption and waste management. The total savings from these projects is USD 793,836 since the inception of the GLS project in Jan 2008. WCBF averages 200+ senior-level attendees at its Six Sigma conferences. This is the largest gathering in 2009 for those who are passionate about achieving process and business excellence. The focus of this elite awards program is to demonstrate to the global business community the real results and excellence which organizations achieve through the successful deployment of Six Sigma and other business excellence programs. The Awards present a great opportunity for organizations to win recognition for the great work that their Six Sigma and business excellence people are delivering to customers, shareholders and other key stakeholders. This is the second award recognizing the GLS initiative of WNS; The earlier one being the Golden Peacock Award 2009 won in India this June. The award was received by Mr. Daniel Wollenberg, Head - Global Transformation Practices, WNS. 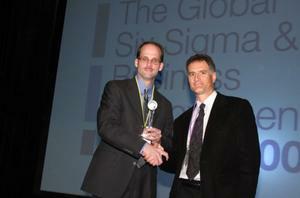 The summit is the largest senior-level Lean Six Sigma event in the industry. The award was sponsored by Instantis PACCAR Vanguard.